Over four million Syrians fled their homeland after civil war broke out in 2011, with many of those seeking to start a new life in Europe. One of those refugees, 17-year-old Mohammad from Aleppo, pushed himself to the limit after a torturous 3,660km journey through seven countries. 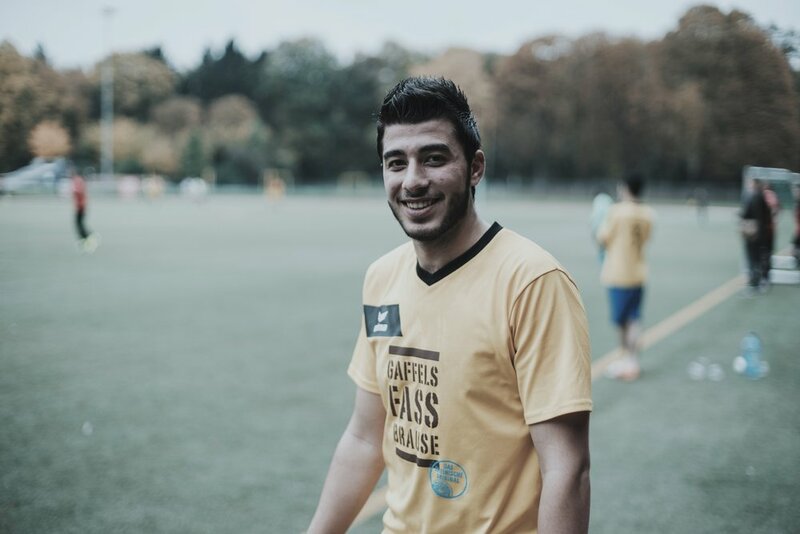 Now living in the German city of Cologne, Mohammad explains how football has helped him settle in a foreign land. Rabona: Tell us about your journey from Syria to Germany. Mohammad: I lived in in the centre of Aleppo, Syria, for 17 years. At the end of 2012, we had to leave the city and our country and fled in a car to the Turkish city Gaziantep, which is approximately 120km away from Aleppo. We stayed there for 15 months until we could make our way to Germany. Our trip to Germany felt like an eternity and it pushed us to our physical limits. In Mersin [Turkey], we boarded an old boat with more than 180 other Syrians, which was meant to bring us to Europe. We endured 12 exhausting days without food and only one glass of water per day. It was like a blind roller in the middle of the sea. It was an indescribably hard time. After arriving in Sicilia [Italy], we were received by the police, who flew us directly to Turin. We didn’t expect this. We stayed in Turin for two days until we made our way to France by car, but we were arrested shortly before crossing the French border and spent four hours in prison. The main reason for the continuation of our journey was my uncle in Krefeld [Germany]. Thankfully, we could specify a specific destination and, with that issue settled, we took the train to Krefeld. In Cologne, we finally received asylum and spent 10 months in a hotel which had been made available for refugees. My mother and my two little sisters followed us, and we then rented an apartment in a nice district in Cologne. My older sister, who is a photojournalist for Reuters, also left Syria recently. In 2013, she received the “Courage in Journalism Award” for reporting from the frontline of the war, but things have become too dangerous, even for her. Including the stopover in Turkey, the trip to Germany took us 19 months. Rabona: Was there a specific moment that you decided you had to leave? Mohammad: Yes, there was definitely a specific moment. My father works as a doctor in general medicine, and he helped the Free Syrian Army [anti-Assad rebels]. Unfortunately, he worked in an area which was partly controlled by the Syrian Army [President Assad's pro-government force]. One day, the Syrian Army stood in front of our house with the intention to arrest or kill us, but luckily nobody was at home at that moment. The Army labelled my father and my sister as traitors and terrorists, which was around the same time that one of my schoolmates was killed by a bomb. These two experiences proved the time had come to find a way out of Syria. Rabona: What were your first impressions of Germany? Mohammad: Actually, I was born in Krefeld [in North Rhine-Westphalia]. My father worked as a doctor in Syria, so my mother and I left when I was three months old. My mother wanted to live together as a family in one place, and Syria was a peaceful country at that time. I always said to my mother, “When I’m old enough, I want to visit the country in which I was born.” That dream has now come true, 18 years later. My first days in Germany were exciting, but one feeling dominated all others — the feeling of safety. Rabona: What are your thoughts on the attacks that happened on New Year’s Eve in Cologne? Mohammad: Refugees are normal human beings. I’m against what happened on New Year’s Eve, just like any other normal person. I don't feel ashamed or guilty, quite simply because I didn't do it. I don't know what I can change but I’m angry at whoever commits these kinds of acts, not just refugees. I get so many questions about it, and that also made me angry. It is like the stigma to all Germans because Hitler was German. Now all refugees will be pointed at because of a few who harassed the girls. There are more than one million refugee here in Germany, but those who caused this trouble are less than 1% of the total number. Why focus on the negatives and stigmatise all refugees? Rabona: How has football helped you settle in Germany? Mohammad: Football has brought happiness back into my life. I’ve met many new friends, and it has helped me improve my German. On top of that, football brings structure to my life. Because of the training, the matches and tournaments, I have a function, and I’m not wasting my time. The Rheinflanke [a social welfare program] has assigned me many tasks connected to football and recently I worked as a trainer at a football camp for refugees. We played a tournament recently that was kind of special, because we played against another refugee team. The morning of the game was also special as I had the opportunity to show the other teams from all over Germany my new home. That was an awesome feeling. Rabona: Tell us about your team. What league do you play in? What position do you play? Right now, we play in the Kreisliga D, the lowest league in Germany. But we are working hard to move up to a higher league soon. I think this will take some time, but I try to support my team through many goals from my positions, which is the left or right midfield. Rabona: Is there a passion for football in Syria? Mohammad: You know, in Germany, and Europe in general, there is a lot of enthusiasm for football. In Syria, the quality isn’t as good as in Europe, but many people still go to the stadiums to watch games. There are two or three leagues, but they are quite disorganised. So the fans always meet in cafes to watch the European leagues. A few watch the Bundesliga, but many prefer La Liga, and especially the Premier League. My favourite team is Real Madrid. Isco, especially, is one of my favourite players and I look up to him because of his technique and elegance. In Germany, I like Bayern Munich. I hope one day I can attend a match of one of those teams.